Here is a quick snapshot of what’s been going on in the majors this past week. unlikely person to chase this but so did Bradley Jr. the week before. We’ve seen Corey Seager turn up the heat as of late. He hit 5 homeruns in a series. name. Duvall was acquired from the Giants in a trade that sent Mike Leake to the Bay. possibly be talking about a NL ROY? 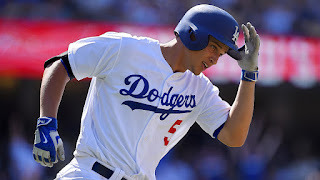 Corey Seager, Aaron Nola, Adam Duvall? We’ll see…. be a huge powerhouse. Then injuries progressed and he seemed to have lost his talent. Well, he is back! As I write this Trumbo leads the majors with 19 homeruns and batting .295. Those are pretty nice numbers considering you’re in a lineup with Crush Davis, Adam Jones, & Manny Machado. I want to see him succeed and wouldn’t mind seeing the O’s take the east. Now if only they could address the pitching. In the AL Central we recently seen the Indians make a statement by sweeping the Royals. With a young core in Cleveland we may be in the midst of watching a team getting it’s feet underneath them. Last night Trevor Bauer got the win and had 10 K’s. Salazar isn’t looking too bad at all. Guys are clicking right now and it’s exciting. I’m excited to see how the playoffs shake out this year with all of the unfamiliar faces (in recent years) playing baseball in October. With that being said, what happened in Chicago? I mean the Cubs are still playing like they have a purpose but at one point this season the White Sox were right there with them and now they’re almost a .500 ball club. Touting a 29-28 record fans have got to be upset after such a hot start. Frazier coming to the south side seems to have sparked some excitement with him performing well but now something is wrong. They recently acquired James Shields from San Diego but will that be enough to get back in this? The question to ask may be, will Shields even be an impact player now? Perhaps his best days were in Tampa when him and David Price were the 1-2 punch. It will be interesting to see what happens before the all-star break. Madison Bumgarner has made it clear that he is interested in being in the home run derby this year. Whaaaaaat?!? 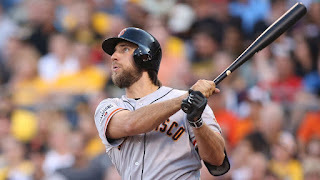 The pitcher has hit 11 homeruns now in his career and there are some interesting stats floating around that suggest he is just as good a hitter as Mike Trout and Bryce Harper in the last 190 plate appearances. I’m not convinced that he is that good of a hitter given that he isn’t consistently getting at-bats every night but it is definitely something that I’d like to see assuming that it doesn’t take away from a more deserving hitter.